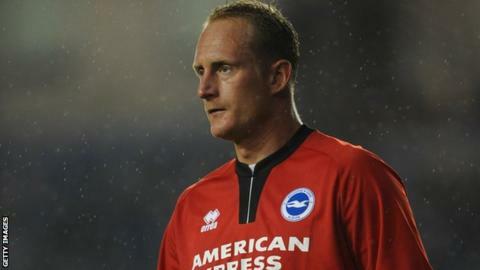 Brighton's Casper Ankergren says the life of a substitute keeper is not an easy one after making just his second appearance of the season on Saturday. The Dane stepped in for the 3-0 win over Charlton after number one Tomasz Kuszczak was taken ill pre-match. "As a substitute goalkeeper it is very rare you actually play," Ankergren, 34, told BBC Sussex. "You need to prepare like you are going to play and sometimes that is mentally quite tough. I'm happy it paid off." He added: "It's different compared to an outfielder as you never get on and play for 10 minutes or half an hour. "You know when the game starts there is a big chance you will not be playing." Ankergren's only previous appearance this season came in the Capital One Cup defeat to Newport County in August. Former Manchester United stopper Kuszczak has played in 37 of Brighton's 42 league games this season, while Peter Brezovan deputised for a four-game spell in December and was handed the gloves during Albion's FA Cup run. Ankergren was happy to seize the chance as he made his first Championship appearance in almost a year. "It was my turn to be on the bench," Ankergren said. "When we came in at about 11 o'clock Tomasz said he wasn't feeling great. I actually thought he would play anyway but an hour later, after we had some food, he said he couldn't play. "I've tried to work hard in training and be professional. "If the chance comes along I would be absolutely devastated if I haven't prepared well then suddenly played and didn't perform. "I would be really angry with myself but I know I give myself the best possible chance." Former Leeds player Ankergren joined the Seagulls on a free transfer in summer 2010 and was an integral part of the Sussex club's League One title-winning campaign in 2010-11. He is out of contract at the end of this season and is open to extending his deal at the Amex Stadium. "I'm happy here and my family is happy here," he said. "It is not really up to me and I haven't heard anything from the club. We have to wait and see."